I have a great debt of gratitude to those who joined us in the great Open Innovation Exchange (OIE) experiment which I ended up getting a lot of credit for but was really the brain child of David Wilcox et al. The Open Innovation Exchange developed a competitive bid for a UK Government contract in the open, online and the bid was much better as a result. One thing was clear from the OIE experiment, and that was, that the more people you can convene around an idea the better the idea will become. It’s not that others necessarily come up with better ideas but they will challenge it and force those who put up the idea to improve it or let it die. This is exactly what’s happened with ColaLife. 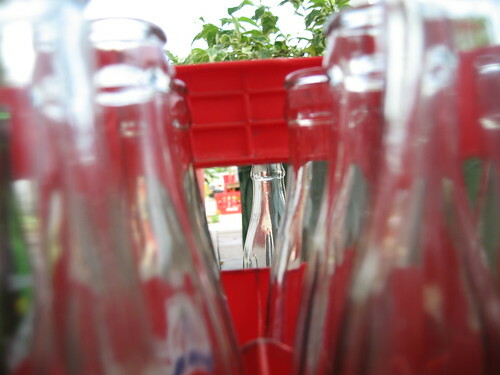 The idea I put up in May 2008 was that Coca-Cola should remove one bottle in every 10 crates and replace it with a cylinder containing Oral Rehydration Salts (ORS). Now we are talking about a wedge-shaped container (not a cylinder) that makes use of the unused space in a crate AND with local determination of what goes on the container – ORS may not be what’s required in every location, all year round. We’ve gone from a good idea to a brilliant idea (IMHO) because of the way the idea has been exposed, discussed and challenged. There are other benefits from this process and this became very apparent in the interview I’ve been through today (22/12/09) for the Buckminster Fuller Challenge. I was very relaxed going into the interview because I was pretty sure there wasn’t a question that they could come up with that I hadn’t been asked already by a ColaLife supporter in the discussion/challenge process that has gone on over the last 18 months. And that proved to be the case. There’s the one that everyone knows. If you’re a lone voice, you are easy to ignore especially if you’re trying to get the attention of one of the biggest brands on the planet (Cola-Cola in our case). Lot’s people saying the same thing are more difficult to ignore and this has proved to be the case with ColaLife. We’ve managed to get Coca-Cola’s attention. A crucial first step in our case! If people convene around an idea it gives you huge confidence that the idea must be a good one. This is really important when you come to try and sell the idea to others (eg potential supporters) who have to be convinced. As I have said before, this is why I believe in open innovation. Thanks for the mention Simon … despite your modesty you will definitely get more nominations for managing both from the back and in front! I think that open innovation requires a special sort of leadership, and we could do with you in a few other places too. One of the issues – which I think you are also working on – is how to mix the gift economy of people’s voluntary contributions, with the paid-for requirements of putting bread on the table and covering other real costs. In 2010 we’ll be trying some experiments in that over at socialbysocial.net where I’ve also flown the exchange idea again. I think open business, and doing more with less through more sharing and collaboration, could be very relevant in the tough times ahead. Thanks for sticking at it – you make it look easy, but we know it isn’t.